For his latest experiment, Malt Master Brian Kinsman found his inspiration in the freezing vineyards of the renowned Peller Estates winery near Niagara, Canada. When he returned to the Glenfiddich Distillery in Dufftown, his memories of the extreme conditions and the unique production process of the intensely sweet Icewine led him to experiment with several French oak Icewine casks. What he found fascinated him. 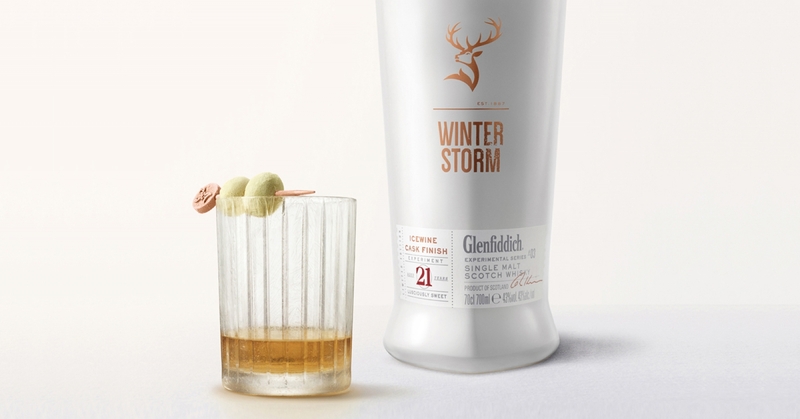 The taste is a perfect combination of both pioneering liquids, the heightened candied sweets and oakiness of Glenfiddich are complemented by mouth-watering tropical fruit notes and a luscious sweetness from the unique Icewine cask finish. Brian experienced the freezing Canadian January weather to learn about how the grapes had to be picked at moonlight at -10˚C when they were as hard as pebbles. Working with Peller Estates VP of Winemaking, Craig McDonald, it was an opportunity to push the boundaries of taste to create a new unexpected whisky. Brian experimented with several French oak Icewine casks from the Canadian winery, filling them with different Glenfiddich aged malts for up to six months. Only the rarer whiskies, those aged for 21 years, could cope with the extra Icewine intensity. Brian’s skill in finishing this unique experiment has created a lusciously sweet, short, crisp whisky that offers soft sweet notes reminiscent of candied fruit and Turkish delight that develop into flavours of mouth-watering lychee. The fusion of sweet flavours is soon met with a rich drying sensation from the Icewine. Described as a perfect Glenfiddich 21 year old, Peller Estate’s Craig McDonald sees it as “a unique balance of the warming soul of whisky and the frozen cold of Icewine.” The taste is a perfect combination of both pioneering liquids, the heightened candied sweets and oakiness of Glenfiddich, complemented by mouth-watering tropical fruit notes and underlying wine notes. Our best minds got together to discover the perfect compliment to this already extraordinary expression. And this is what they discovered. Step 1 Use a clean, frozen glass. Step 2 Pour the preferred measure of Glenfiddich Winter Storm. Step 3 Add a frozen grape. Step 4 Enjoy as the perfect accompaniment to dessert. Leave the frozen grape to thaw gently in the whisky. When you’ve finished, eat the grape to enjoy a satisfying sweet crunch of the crisp fruit, steeped in the flavours of Winter Storm.